Re: VI - REPORT: Korean researchers discovered the 'Suwon crease', only observed in males! Lynn wrote: hi Patti, I am not sure they are describing the same thing as the Suwon? Aren't they talking about sydney line + (some form of )heart line, OR straight heartline that extends fully across the hand with (some form of) head line?? From my understanding it's the heart line's version of a Sydney line. In the Suwon crease they have given strict criteria for how to decide if it's a long heart line or one that is joined to a head line. III + II. Study Fig. 3. Sydney line has the head line being called II + III (headline plus heartline) with Accessory III (heart line). The Suwon crease is II + III (head line plus heart line) with Accessory II (head line). This is what the purple quote above is saying too. They just didn't break it down into distinct details as the Korean scientists have. Lynn wrote: Phew that took some reading! Page 7 already!! this one could run & run! I love these "thinking out loud till I've understood it" discussions, reminds me of 'tented arch' discussion on Sue's forum, and hand developement on the old cybercafe! I'm still not sure I've understood the criteria of this line correctly. but in Martijn's first example on Page1, the Suwon does not curve down to headline. Great to see you sharing those examples... I say: I see two 'Suwon creases'!! By the way, I can understand where Patti's argument comes from... but beyond the "II+III plus accessory II" description the researchers by fact did not describe any additional specific requirement for recognizing a 'Suwon crease'. They only describe how to descriminate the 'major lines' from the 'minor' lines!! So, I see no reason at all to ASSUME (like Patti did) that a 'Suwon crease' really requires the presence of a head line which is connected to the life line. And after saying this... I think you already understood that you should also not 'worry' about whether a 'Suwon crease' is curving down or not. PS. EDIT: Patti's reference to the 'strict criteria' described by the researchers... only relates to how to discriminate the 'minor lines' from the 'major lines'. Byeond their formular, the researches have made no additonal specification at all for the 'Suwon crease'. Yes, but from all these posts you can see that they have a very strict criteria as to how to classify it. The quote from Plato's book above (a very respected, now deceased hand researcher) didn't classify it further. Have you just dismissed the entire report? If you look at the charts in Fig. 7 they show the starting point as constant. There are three rows. The center column shows the starts of the head line in the Normal crease, the Simian crease and the Sydney crease. All are marked as starting at the radial edge of the palm. "The termination points of I, II and III were variable between individuals, while the starting points are constant." In the notes I scribbled on the page I wrote "we know this isn't true" in reference to the starting points. The more I read, the more I realized how narrow and strictly they held to their definitions. If you're calling it a Suwon crease you probably should follow the scientists of Suwon, Korea's definition. If you like better Martijn's now very relaxed definition - you may just as well call it a long heart line. Patti wrote: In "Dermatoglyphics, Science in Transition" (Plato, Garruto & Schaumann 1991)(page 231) they make reference to this crease. 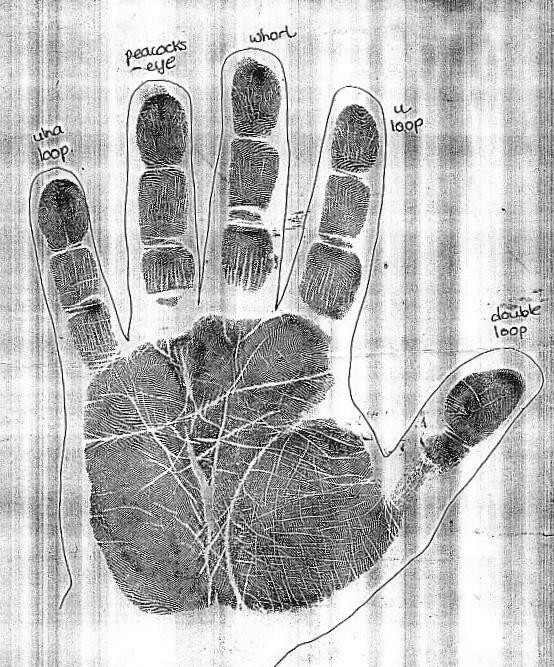 "On occasion, one encounters an erroneous classification of a "simian" crease on a palm with either the proximal or the distal crease extending across the whole width of the palm in the presence of the other crease. These variations have been illustrated by Leiber*. One of them, the extension of the proximal transverse crease to the ulnar margin of the palm, with persisting distal transverse crease, is also known as a Sydney line and should definitely not be confused with the single transverse crease." Obviously the Korean researchers missed Leiber's illustrations and overlooked Plato's books as well. This crease was identified 50 years ago and mentioned in this book 20 years ago! <edit> The quote above in purple is from the above mentioned book, but I forgot to mention that this chapter is called "Flexion Creases" and is written by S. Kimura and B. Schaumann. Lynn wrote: hi Patti, I am not sure they (in your above post) are describing the same thing as the Suwon? Aren't they talking about sydney line + (some form of )heart line, OR straight heartline that extends fully across the hand with (some form of) head line?? Sorry Patti... but Lynn's feedback is 'spot-on'! ".. either the proximal or the distal crease extending across the whole width of the palm .. "
The purple words from "Dermatoglyphics, Science in Transition" only relate to a Sydney line + transversal heart line... but you already concluded that the Korean researchers did not do their homework properly!! Remember when I talked about 'out-of-context' conclusions? Though, this is probably the most explicite example so far in this discussion. Hi Felicity, I asume that you tried to describe in your comment the basic characteristic of a 'Suwon crease'? If so, then I can confirm Lynn's feedback... though I would like to add that the combination of the heart line and the 'additional head line' should make a constellation that overlaps the full palm. By the way, if it's just II + III with accessory II - then why all the rejections of the samples? Don't bother answering. I can see you are "fixed" in your positions and are no longer clear yourself on what details a Suwon crease. Martijn, thanks for making me laugh with 'Capice?' Your reply "Once again, let's it keep it simple" :reminds me of a business course I attended in 1996, their key word was K.I.S.S. = "keep it simple stupid"
Unfortunately I don't always follow that advice and tend to make things too complicated! Patti wrote: By the way, if it's just II + III with accessory II - then why all the rejections of the samples? Patti, please specify... are you referring to your 'splitting heart lines' examples??? PPS. And I hope you also notice that I confirmed Lynn's feedback on your quote from the other scientific sources... I think it is very obvious that you made a mistake to associated that quote with the 'Suwon crease'. PS. Patti, this comment is not much more than a 'perception'. But you're welcome to substantiate exactly what you have in mind! Regarding my last sample. When I zoom the image, I can see the creases are very finely overlapping and not merging. Perhaps the researchers would eliminate that sample, too. They don't mention overlapping. I've seen many simian and Sydney creases that have this fine overlapping. First of all... thank you for (finally ) answering my question! Second, haven't you noticed that you have been in a constant process of 'flip-flopping' in this discussion? Regarding my female-cases... first you rejected that one, then you accepted it, then you rejected it again, and finally you presented the suggestion to call it 'partial Suwon crease'. And so, now you left me wondering... is you offer to 'agree that we disagree' still up-to-date??? Sorry Patti, while you think that I have 'fixed' believes... my problem is basically that I can not relate to your approach: in your comments you only focuss on (isolated) minor details in the examples that we discussed. Andactually... I think this even explains your constant process of 'flip-flopping' in this discussion!! Regarding your last sample: you used an 'overlapping' as an argument to conclude that there must me a meeting of two different lines. But I would like to point out that this is basically only a relatively normal tendency to be in a heart line. And as a matter of fact: I can point in that heartline at three other likewise locations where overlapping/merging is seen: see the picture below. So, basically... I don't understand how you can use only one of those 'overlappings' in this heart line as an argument to conclude that this is 'Suwon crease'!? And after making this observation... I am wondering: how could anybody accept such an answer as a 'balanced' argument to call this example a 'Suwon crease'??? Patti, if others would start adopting your focuss on (isolated) minor details.... then I am sure one could find arguments for EACH SINGLE EXAMPLE of the true 'Suwon creases' that we have seen so far in this discussion: let's say... the ones about where we agreed at some moment in time: for you are constantly 'flip-flopping'... because you just also made a statement that sort of was an rejection my first male-example!! And I am sure ... with your method one could even find arguments to reject the single example presented by the researches!! After all... let's not forget that our early considerations have shown that even with the researcher's example (+ combined with the descriptions in their article) it took quite a lot of efforts to understand & describe the concept behind the researchers' discovery! Because their 'strict' criteria provide no additional specifications regarding the Suwon crease. Basically these only describe how to recognize the difference between 'major lines' and 'minor lines'... and yes of courese we MUST apply them on the Suwon crease as well. But these have no implications at all regarding the starting point of the 'accessory II' line. Martijn, thanks for making me laugh with 'Capice?' Your reply reminds me of a business course I attended in 1996, their key word was K.I.S.S. Obviously, yes it is a complex issue... because recognizing a 'Suwon crease' requires to take quite a few aspects of the major lines in consideraton. Sounds it bit like E = mc2 ... doesn't it? But basically... ... the 'process' in this discussion makes it look like even more complex than it really is!! Still I prefer to see it as III + accessory II plus II. Regarding the branching of the heartline in the sample Martijn, I'm not sure why you are mentioning these as disqualifying factors. Page 176 addresses branches. No where does it say the III crease should not contain branches or splitting creases in it's body. They discuss in detail, as you point out, what defines a major crease and what describes a minor crease. They also describe how a minor crease meets the major crease. When you study closely their only sample you will note it also has a tendency to branch - in fact right where the arrow is pointing. They also point out that III or the heart line is more prone to proximal branching. I think the deep clear crease that rises up to the heart line would be categorized as a II crease and not a III. This is because of it's quality as it rises to meet the heart line. Hopefully, in the near future the researchers will add to their samples in Fig. 4 and charts in Fig. 7 the variations of the Suwon crease. If it's simply II + III with an Accessory II (defined by strict guidelines) then just like the II + III with Accessory III there will be acceptable variances. Just as you see in Fig. 4. the 6 different variations of a Sydney line. There most likely isn't just one type of Suwon crease. So your attempt at disqualifying my last sample for it's nature to split is simply your opinion. I, in an earlier post said it may not be a Suwon, only because the incoming crease does not actually "touch" the heart line. Also, I do think, for sure that Plato's book is referring to the Suwon crease, of course not by that name. They are describing two types of II + III that are not simian. The one involving the head line was already described as the Sydney crease. I have found Leiber's charts. Bali & Chaube say it's "comprehensive enough to accommodate all crease types in its fold." Beginning on Page 131 of "Anthropology of Crease Morphogenesis"
You're right: basically I have the same preference... but I thought it would be less confusing to simply follow the vocabulary of the researchers!? I hope this makes sense, and thank you for pointing that out. Patti, obviously in Plato's book the two variants mentioned do not refer to a 'II + III' line at all... there is not even a single 'suggestion' which could relate your quote to the 'Suwon crease'. But you made the connection somehow... even after re-reading. 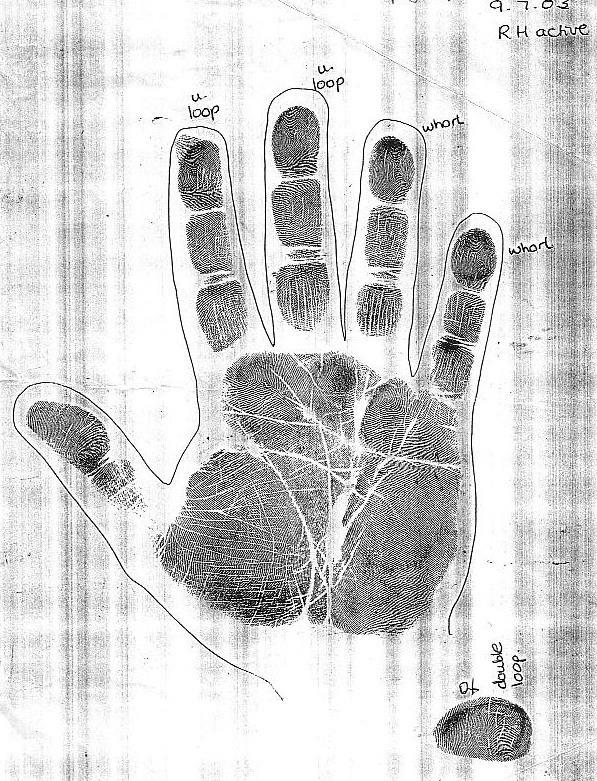 ".. one encounters an erroneous classification of a "simian" crease on a palm with either the proximal or the distal crease extending across the whole .. "
And what the researchers describe here perfectly makes sense: because many inexperienced people who are confronted with a Sydney line... make the mistake to assume that it concerns a simian line. That is the only 'message' described by this quote! Additionally... for sure, Leiber's charts do not describe any variant that relates to the complex 'Suwon crease' either. Not in chart A, nor chart B, and not even in their third chart AB. Patti, your conclusion that the 'Suwon crease' (or a likewise complex crease variant) was already described by other researchers... is not true. I am sorry, you simply mis-read your quote! Patti wrote: Also, I do think, for sure that Plato's book is referring to the Suwon crease, of course not by that name. They are describing two types of II + III that are not simian. The one involving the head line was already described as the Sydney crease. Hi Patti, Having read it all again, I don't understand how you reach the conclusion that Plato's book is referring to the Suwon. The quote is saying that sometimes the Sydney line or a complete transversal heart line are erroneously classified as Simian lines. But they are not Simians due to the presence of the other (heart or head) crease. I looked at Leiber's illustrations and I don't see anything that resembles a Suwon crease. Patti wrote: The left hand is interesting as the head line is fragmented and doesn't start close enough to the radial edge of the palm. (the article refers to a common starting point and this head line doesn't start at that, as they say, "constant" starting point. Thanks for feedback Patti. I briefly read some of the article when Martijn first posted it, but didn't digest it, so wasn't aware of the 'common starting point' and didn't take into consideration that the start of his main headline is missing on LH. Admittedly the sample I posted starts further into the palm than most headlines, but I think we agree it's a headline. So I guess the left hand sample I posted is a Suwon as it consists of lines II and III+II. (I've looked at it under magnifying glass and can see that the fate line does stop at the heartline, and the upward branch is part of the heartline). Patti wrote: Regarding the branching of the heartline in the sample Martijn, I'm not sure why you are mentioning these as disqualifying factors. I am using this argument to illustrate that likely your last example can best be described as a 'multiple-splitting transveral heart line'. For, I think the first and the third 'splitting' (left to right) show a likewise pattern over overlapping 'splittings'. I don't see any clue which could indicate that a head line is involved in this transversal pattern - and therefore I asked you to share with me your major argument! Then you described that you observe "the creases are very finely overlapping and not merging". But I think the ZOOMED picture below indicates that only the fourth 'splitting' (on the right) shows no merging. But obviously that is only a very typical pattern for that zone of a heart line (no 'branching' line either). I am doing my very best to follow your argument, but I can not find it in your example (and again, I see not clue at all which clearly could indicate that a second head line can be observed in this example). PS. I noticed that you wrote: "Perhaps the researchers would eliminate that sample, too." Does that indicate that if they gave you that feedback, you would accept and understand their decision? Sometimes a simian crease, or crease that crosses the palm entirely, is classified in error. 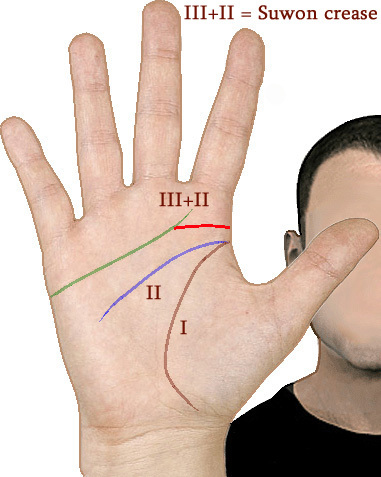 This is when either the proximal (head line) or distal (heart line) crease extends across the whole width of the palm and there is also the "other" crease. In other words, a head line extending all the way across the palm and there is also present a heart line. Or, a heart line extending all the way across the palm and a head line is present. They go on to describe and name one sample (the Sydney line) but do not name or further describe the other crease. Which is now of course the Suwon crease. It's that simple. I don't understand the objections. hi Patti, I think you paraphrased it well,,, until the conclusion you made in the last sentence! One variant is the Sydney line (head line extending all the way across the palm) with the 'other crease', ie heartline, also present. The other variant is a heart line that extends all the way across the palm, with the 'other crease', ie headline, also present. Therefore because of the presence of both creases, the line that completely traverses the palm should not be classified as a Simian. re - "they name one sample (the Sydney line) but do not name or further describe the other crease." The 'other crease' present in this case is the heartline. The other sample is the heartline that completely traverses the palm. You already said all that of course. That's it, that's all they said. What I don't understand is how you made that leap to adding a Suwon crease in your last sentence? Sometimes a simian crease, or crease that crosses the palm entirely, is classified in error. 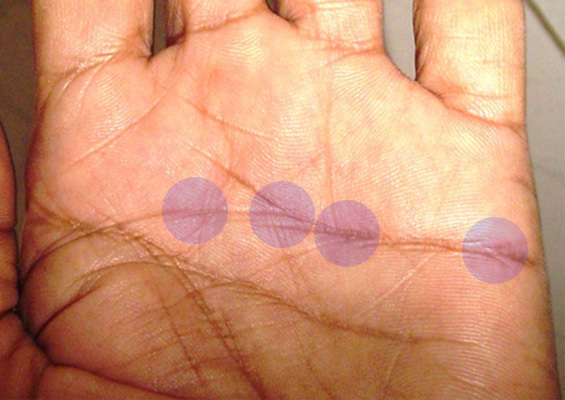 This is when either the proximal (head line) or distal (heart line) crease extends across the whole width of the palm in the presence of the other crease. Thanks for explaining how you read the quote!! We can easily agree regarding the first part of your thouhts (see the quote above). Patti, after reading the 2nd part of your comment... it is now very clear for me that our disagreement is a direct result of how you interpretated the words 'the other crease'. 2 - and in the perspective of the distal crease extending across the whole width of the palm 'the other crease' = the (normal) head line. This is explicitely described in that quote - but you made a completely different association... you assumed that 'the other crease' could refer to the 'Suwon crease', but that is simply a mistake: because the sentence obviously describes how 'the other crease' relates to both 'complete transversal lines'. In other words, a head line extending all the way across the palm and there is also present a heart line. Or, a heart line extending all the way across the palm and a head line is present. They go on to describe and name one sample (the Sydney line) but do not name or further describe the other crease. Which is now of course the Suwon crease. Patti, my explanation above should make it quite easy for you to understand why Lynn and I can not confirm your conclusion. By the way, can I ask one more question? "A 'splitting' distal crease, of which one 'splitting' is extending across the whole width of the palm"
PS. I hope we agree on this, because a 'Suwon crease' really requires that an "extra line" is involved; while a 'splitting' distal crease basically does not have this "extra line".